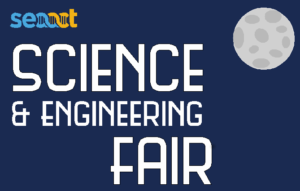 Each year SEAACT organises two major events: the SEAACT Science and Engineering Fair and CONSEAACT. In addition, SEAACT holds regular workshops and professional learning events for teachers. All events are advertised to our members through the SEAACT members email list as they arise. If you do not receive these emails and would like to please contact our Executive Officer. Latest events and PL opportunities can also be found on the SEAACT Facebook page. Normally, a classroom STEM inquiry activity starts with the proposal of a suitable question, followed by students planning and performing an activity/investigation around that question. However, many students have difficulty formulating inquiry questions at the start of the activity. However, in this session Associate Professor, Kieran Lim from Deakin University, will show us how to reverse this approach. You will be involved in hands-on STEM activities with the aim of gaining experience with the equipment, and then to use those activities as the basis of asking multiple inquiry questions. In the classroom situation, students would then adapt the activity to address their (new) inquiry questions. STEM can be seen as a set of subjects and skills working together to create wonderful projects and a high level of student engagement. However, projects can be carefully planned and considered to meet many outcomes in the Australian Curriculum while providing opportunities for deep conceptual understanding in various subject areas. 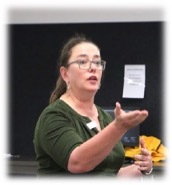 Paula Taylor, a long-time science teacher and the pedagogical leader at the ACT Education Directorate’s Centre for Innovation and Learning, will provide a hands-on workshop to demonstrate how to get the most maths, science and technology learning embedded into your teaching programs. Come along to an afternoon session and find out about PL opportunities and Primary Science resources. Presenters will include representatives from Questacon, Primary Connections, ACT Education Directorate’s Future Skills Academy, Geoscience Australia, the Australian Science Teachers Association, the ACT Woodlands and Wetlands Trust and SEAACT. In addition to the formal presentation, representatives from various ACT science organisations will be on hand to share their services and resources for primary students and teachers. There are many NEWproviders attending this year (ANU Engineering, OZcode Academy, Recycling Discovery Hub etc.) so even if you have attended in the past you will discover something new. CONASTA is the annual science education conference of the Australian Science Teachers Association (ASTA). 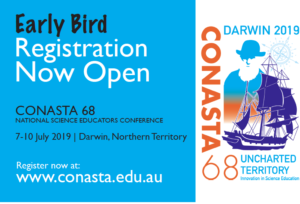 In 2019 CONASTA will be hosted by the Science Teachers Association of the Northern Territory (STANT) and will be held from 7-10 July 2019. For more information on presenting or attending CONASTA, please visit their website – conasta.edu.au. Heavily discounted rates apply to Australian Primary and Secondary teachers for this unique Professional Development opportunity. WHO: Science and geography teachers from around Australia are encouraged to participate, but all teachers (primary and secondary) are welcome. COST: $1095 $550! (includes food, accommodation, on-ground transport and all research costs. Flights not included). Be provided with information and tools on other citizen science programs, and how you can use these to better engage your students on an ongoing basis after theexpedition. Congratulations to Garreth Wigg for being the recipient of this year’s bursary to attend the STEMEd Conference: Future Impact 2019. Applications will open later this year for a single ACT member to attend CONASTA 69 in Canberra in 2020.